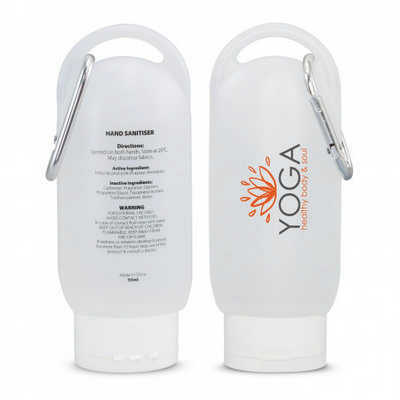 Gel hand sanitiser in a convenient tube with a no mess flip cap and a carabiner clip. It has ingredients information on the back of the tube. Colours: White. Dimension: W 50mm x H 126mm x 16mm (excluding carabiner). Print Description: 30mm x 55mm. Print Type: Pad Print. Packing: Loose packed. Price includes : 1 Col 1 Pos Print. Setup is included.